Consul General Anupam Ray thanked Gov. Abbott and first lady of Texas. Texas Governor Greg Abbott on Sunday hosted a Diwali celebration at the Governor’s Mansion in the states’ capital Austin. During the celebrations, the governor announced that he is planning a trip to India to further increase the relationship and connection between Texas and India. “I’m very proud to tell you that I’m looking forward to taking a trip to India, where we will continue our ongoing relationship and connection between Texas and India,” Abbott said. More than 30 members of the Indian American community, including Consul General of India in Houston Anupam Ray and a few other prominent members of the community from the state, were invited to the special occasion. Gov. Abbott and first lady Cecilia Abbott welcomed everyone to the gathering and extended his Diwali greetings to everyone. The couple also lit the ceremonial lamp. “We’re celebrating Diwali here in Austin, Texas. 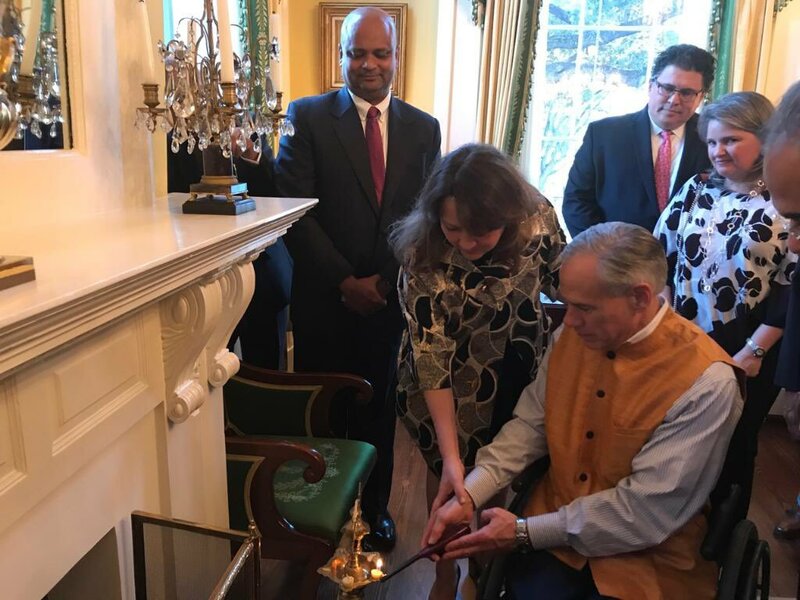 I’m proud to make history as the first governor of Texas to celebrate Diwali, may be one of the governors in the United States,” Abbott, who first hosted a Diwali celebration at the Mansion on 2015, said. “It is recognition of the shared values that exist across the entire globe, certainly shared by people here in Texas, as well as the Indian community both here and across the globe. The principles that are undermining, for the underlying part of Diwali, that you articulated earlier, and that is how lightness overcomes darkness, how knowledge overcomes ignorance, how hope overcomes fear and so, all of these principles working together or exactly what we celebrate all the time here in Texas,” he said. Abbott praised the Indian American community’s contribution and voluntarism while overcoming the challenge of Hurricane Harvey and he said that the way people in Texas came together and responded to the affected people is an example. Consul General Anupam Ray thanked Gov. Abbott and first lady of Texas for opening doors of their Mansion to the Indian American community on Diwali.